Did you know that the Harlem Globetrotters have been playing basketball for more than 85 years? It's true. The franchise got their start in 1926, playing as the Savoy Big Five. If you aren't familiar with the Harlem Globetrotters, they are an exhibition basketball team that combines athleticism, theater and comedy. It's great family entertainment, even if you aren't a sports-fan. We saw our first game last year, and the kids loved it. It's non-stop action, with plenty of up-beat music, audience interaction, jokes and pranks. The talent that these players show is truly amazing. Globetrotters can make basketballs do tricks I couldn't even imagine. 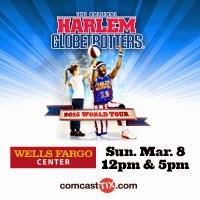 If you are looking to chase the winter blues, the Harlem Globetrotters are coming to the Wells-Fargo Center in Philadelphia on Sunday, March 8th for 2 shows. And thanks to the great people at the Wells Fargo Center, My Scraps readers have the chance to win a Family 4-pack of Tickets. Please note, you must be a US resident, within travel distance to the Wells Fargo Center in Philadelphia, PA. Other restrictions apply, and all ticket administration is handled by the Wells Fargo Center. My favorite is Wilt Chamberlain.